L to R: Sarah (who worked in M-12, Bldg. 5), Josephine (Shop 10, Bldg. 17) and Theresa (administration building), at Republic Aviation Corp., Farmingdale, Long Island. At 79, Josephine Rachiele’s memories of her contributions to the United States during WWII are as crisp as though they happened yesterday. 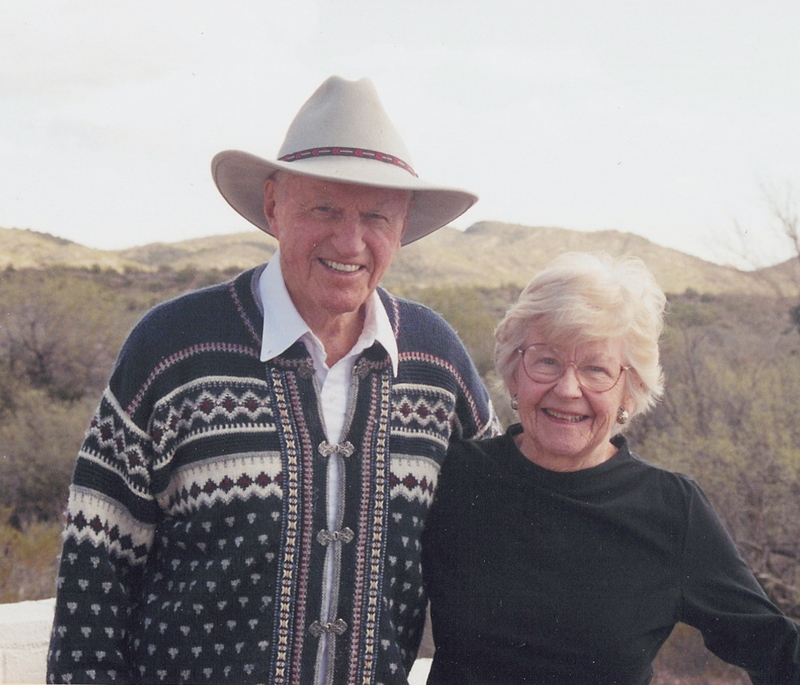 Although the United States was at war, she has fond memories of a time when people pitched in to help the war effort. Most of Rachiele’s friends refer to her not as Josephine or “Josie,” but as “Rosie,” and she doesn’t mind at all. After all, she’s very proud of what the nickname symbolizes. She was a “Rosie” during WWII—a Rosie the Riveter to be exact. When the U.S. entered WWII, many women sprang into action by accepting jobs that the men were not around to take as they went off to war. The slogan, “Do The Job He Left Behind,” was born. A WWII poster, commissioned by the War Production Coordinating Committee depicting “Rosie The Riveter,” was used to encourage women to join the war production workforce. 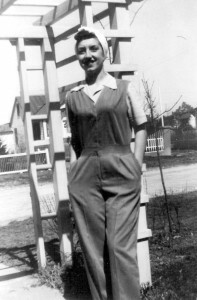 Josephine Rachiele in front of the family home in West Babylon, Long Island, in typical apparel for “Rosie the Riveter” (circa 1945). 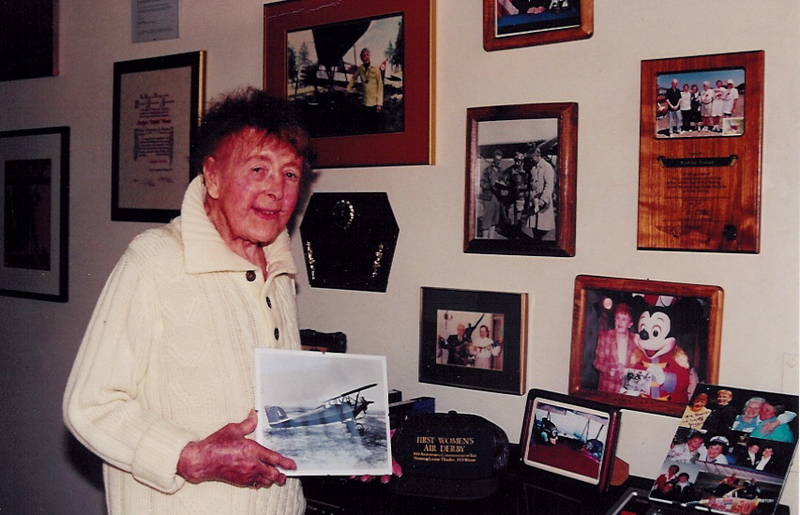 Rachiele, and many women like her, riveted together the parts of P-47 fighter planes at Republic Aviation on Long Island where the aviation manufacturer had its plant. “Being a Rosie the Riveter proved we could do the jobs men traditionally did,” she said. 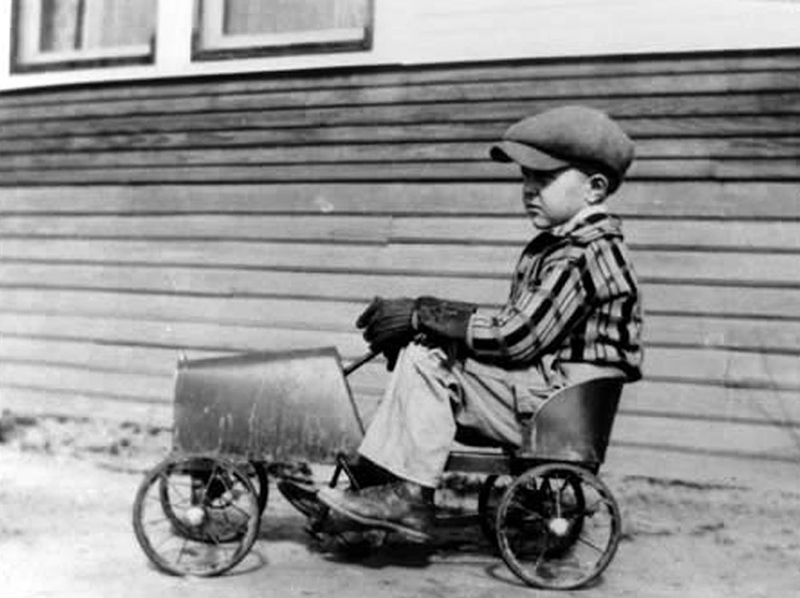 Rachiele started at 60 cents an hour. “By the time the war ended, I was making 90 cents an hour,” she said. This was still a far cry from the $10 a week Rachiele was making in a coat factory prior to joining Republic. It wasn’t all “Rosie” at first. Rachiele had originally applied for a mail girl position, but instead was hired as a riveter. As the days wore on, though, Rachiele became a very adept riveter. “There were a few young men, and the supervisors were men, but by and large women were working in the plant,” she said. 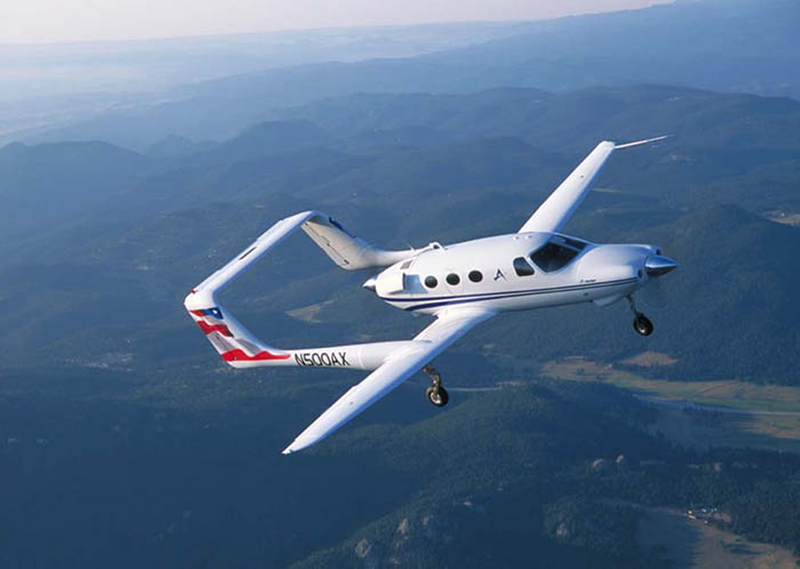 With both Grumman and Republic on Long Island, Rachiele recalled that traffic on the roads was at times overwhelming. Republic wanted to make sure morale remained strong as their workers produced the P-47 Thunderbolts. 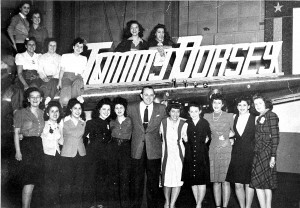 Rachiele vividly remembers visits from the Tommy Dorsey Orchestra, Buddy Rich and comedian Spike Jones. 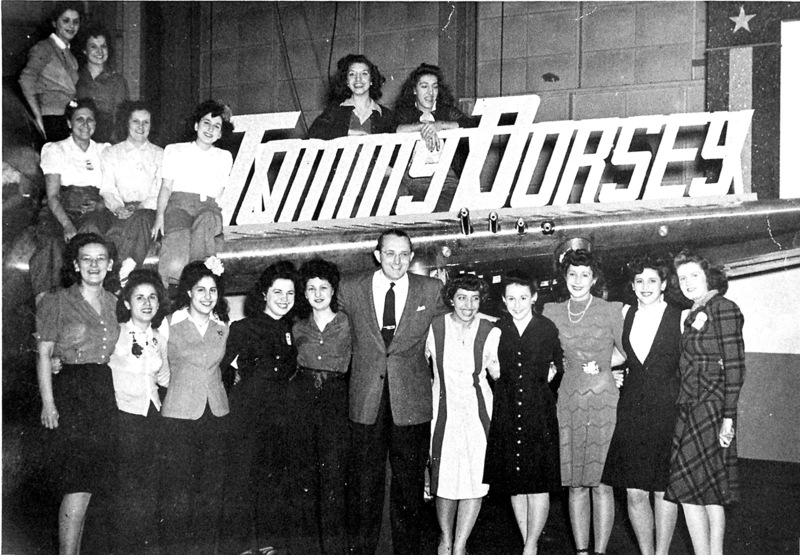 Tommy Dorsey and Republic employees, in Hangar 2, Republic Aviation Corp., with Theresa Rachiele next to Dorsey (in light dress) and Josephine and Sarah (with hand resting on the letter y) directly above him. 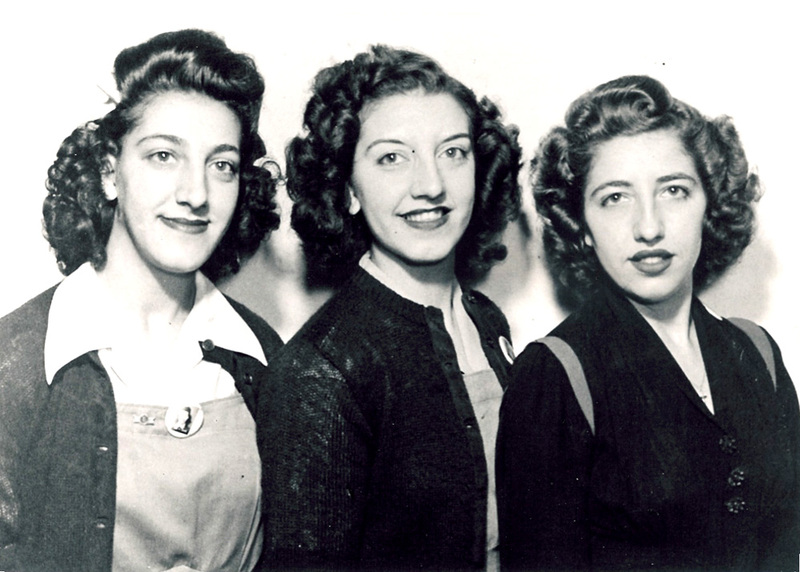 Rachiele’s two sisters, Sarah and Theresa, also worked in the Republic plant. Sarah sharpened drills and Theresa was a secretary at the plant. 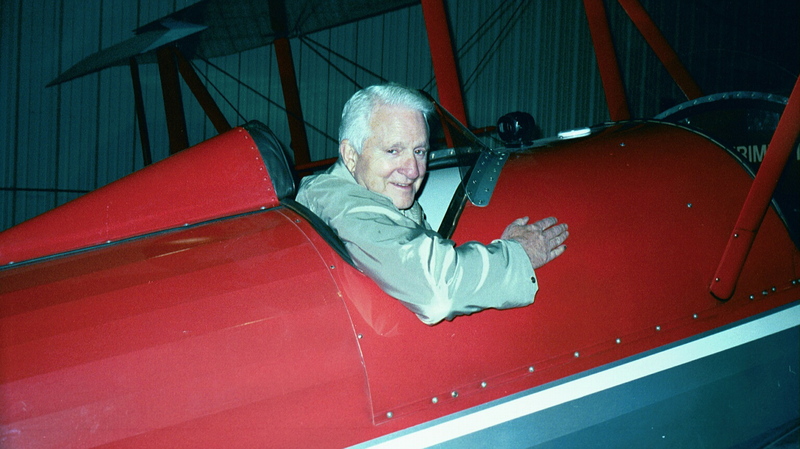 “We were all doing our best to help the war effort,” Rachiele said. Their father, Biagio, not to be outdone by having three daughters in a defense plant, became an auxiliary policeman. Many of those who were stateside also wrote to soldiers on the battlefield to help lift their morale. Rachiele’s pen pal, a local boy named Frank Colombo, died the same day President Franklin D. Roosevelt died, April 12, 1945. 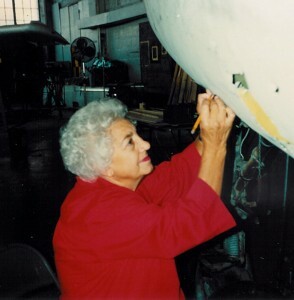 Josephine Rachiele measures an area for a patch on a P-84 being restored at the Cradle of Aviation Museum in Long Island. When the war ended, Rachiele ceded her job to a returning soldier. A year later, however, she was back at Republic where she stayed for the next 40 years, retiring in 1946. 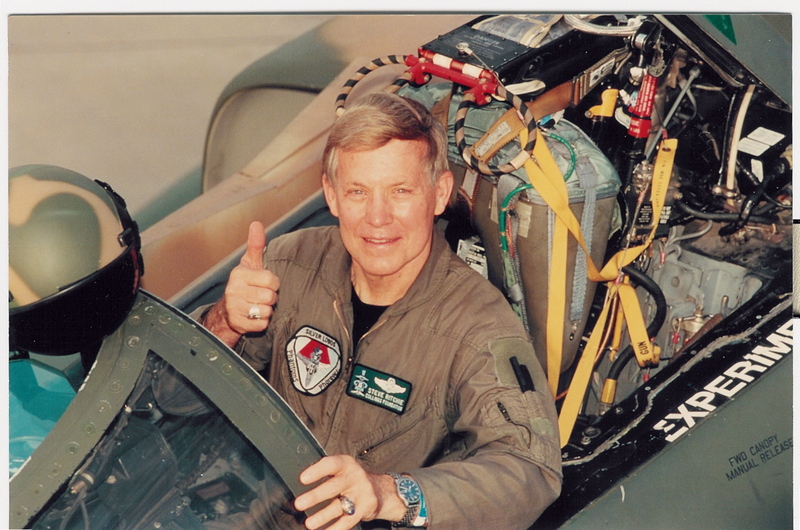 During that time, she built many planes, including the A-10 Thunderbolt II, employed during Desert Storm. She adds that while she was a Rosie the Riveter, everyone was dedicated, and did whatever needed to be done. “We were very patriotic,” she said, adding that she doesn’t know if people are as motivated today. 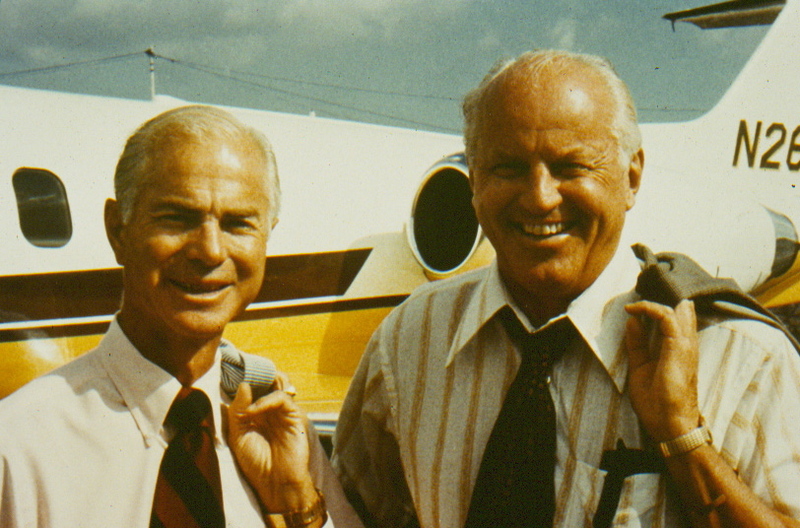 Rachiele is still active in aviation and keeping the memories of that time alive. 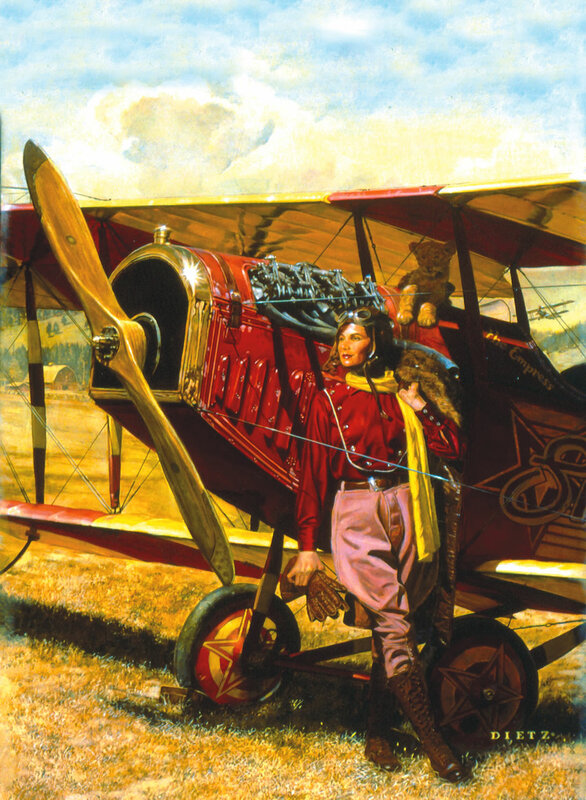 She gives talks at museums, including Long Island’s Cradle of Aviation Museum. 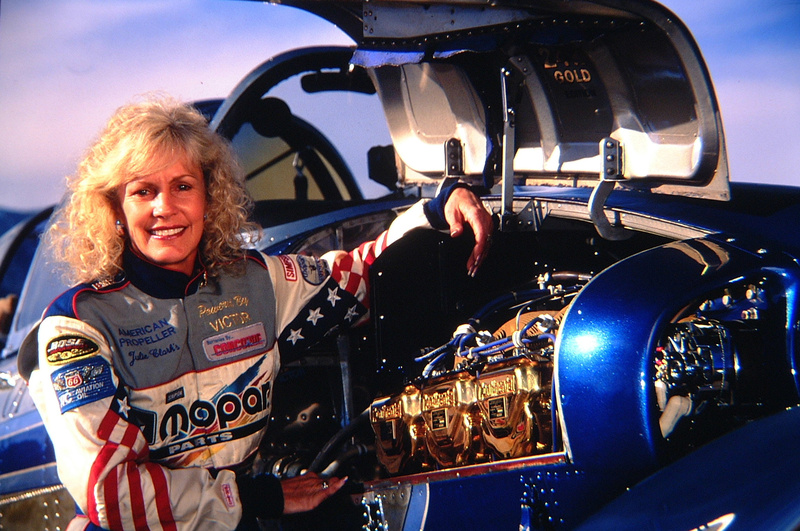 She belongs to Republic’s retirees club which meets about once a week, and to the P-47 Alumni Association. 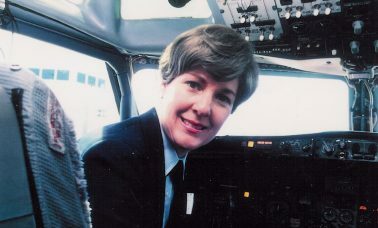 She has also served on the Long Island Republic Historical Society. “I’m still plane-minded,” she mused.